Born and raised in the Edmonton area, I have always loved the green and wild spaces of central Alberta. The beauty of Alberta’s parkland and boreal forest fostered in me an intense curiosity about the how the earth’s natural systems operate and interact. And while this curiosity is not confined to biological questions, I constantly find myself drawn to remote and wild corners of the earth, looking to understand what species are there, and how they live. I have spent time in the jungles of Uganda and Nicaragua observing a range of primates from howler monkeys to chimpanzees. My MSc took me to the jungles of the Cardamom Mountains in Cambodia, where I surveyed the Endangered pileated gibbons that live far from the any human populations but are under threat from the illegal logging and new, massive hydro-electric dam projects. 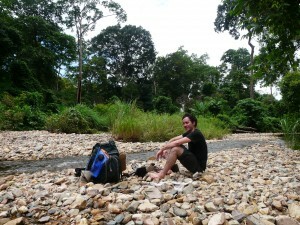 My adventures abroad taught me a great deal about the natural world (and myself! ), not the least of which is that there are important ecological questions to be answered closer to home. My current research concerning large mammal interactions in Alberta’s oil sands region is deeply satisfying to my sense of curiosity and my desire to see the remote corners of the earth. Although I came to biology in a roundabout way (my early academic career focused on physical anthropology), I find using ecology to describe and understand the biological world powerful and compelling. The beauty of the boreal forest only becomes more so when it’s complexity and dynamism is illuminated.